Joel Madden might be falling increasingly in love with our country after three consecutive seasons of The Voice Australia, but it's his better half, Nicole Richie, that we're all seriously girl-crushing on. Whether it's her impeccable style or ever-changing hair colour, the girl's got us hooked. ELLE Australia seems to think so too, choosing the House of Harlow designer to front its July 2014 issue in a circus-inspired shoot. Shot by Justin Coit and styled by Nicole Bonython-Hines, the editorial took place in an L.A. circus scrap yard with Richie wearing dramatic head pieces and zebra-print frocks fit for your high-end carnival folk. 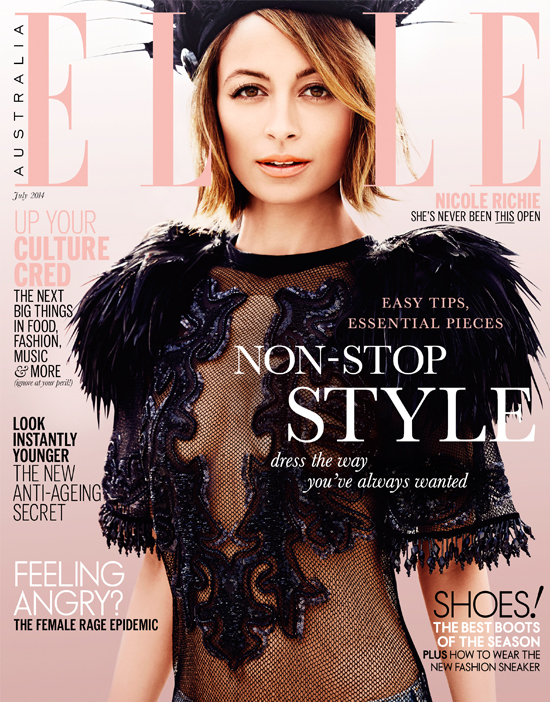 It seems the clothes could come secondary to her tell-all interview though, with ELLE Australia hinting at what you will find should you buy the issue that hit stands today. So if you've always wanted to know more about her 82-minute stint in jail or what her hubby thinks of her dad, Lionel Richie, then this might be the issue you want to fork out $8.50 for.